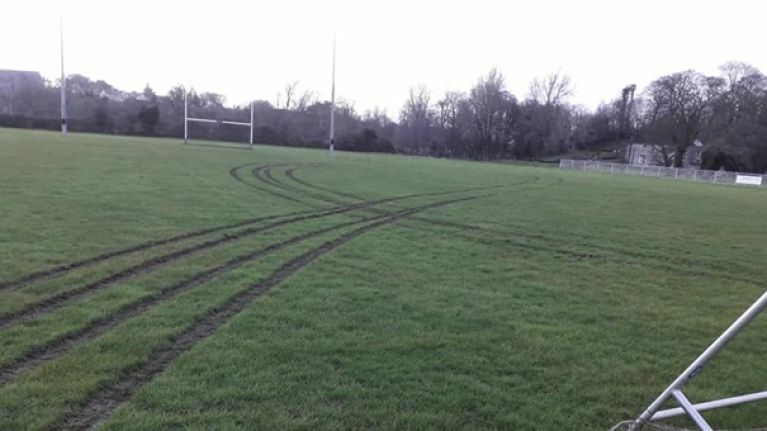 Thomastown GAA club had their pitch ruined after the surface was damaged overnight by unwelcomed visitors. The club leave their gates open for players to come and have a puck-a-round whenever they want to but their lax rules around entry were taken advantage of on Friday night when the surface was ripped up by a jeep. Thomastown club secretary Michael Walsh said that the Gardai had located the suspected vehicle and that the damage may actually galvanise the club. "It's a pity," said club secretary Micahel Walsh. "The jeep was found last night, whatever they were doing, they lost their license plate off the front of the jeep so the Gardai have that but they located the jeep last night. We were on the phone to the Kilkenny county board and they won't let us down. We'll sort it out. "We were only down there doing work on the pitch and we were worried about it getting damaged and then this happens. The chairman Ger Walsh's family owned the land and we all grew up playing on it so we might lock the big gate now but we'll definitely leave the pitch gate open to still lets players come down and play. "The pitch is over 100 years old and we all would have grown up on playing on it but to be honest the amount of goodwill that you get when something like this happens it just galvanises the club. "We're playing football and there's a Leinster Camogie pitch going on so we have our second pitch ready to go tomorrow but we'll manage."